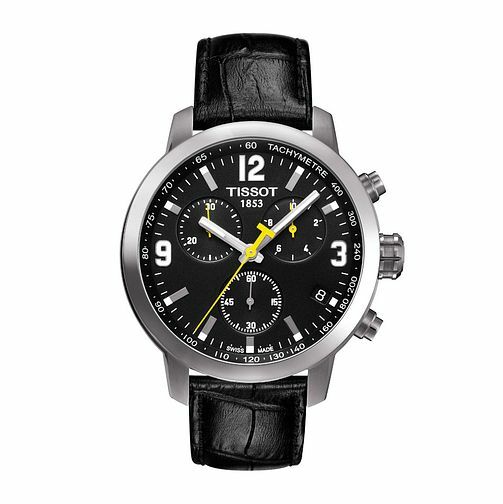 A stylish, men's Tissot strap watch with a sports inspired edge. Features a black leather croc effect strap, set with a sleek, stainless steel case and black chronograph dial. Finished with flashes of striking yellow detailing. Tissot PRC200 men's stainless steel black strap watch is rated 5.0 out of 5 by 2. Rated 5 out of 5 by Anonymous from Lovely watch Great watch at a great price, I need to replace the strap with a rubber one, but still a great purchase. Rated 5 out of 5 by Anonymous from Clear face with Striking Hands Tissot are a long established Swiss Watchmaker, their products are a high quality product which are very fashionable. This particular watch is very striking with its bright yellow hands it has a luxurious leather strap with a safety-clasp. I have wanted this particular watch for some time and it doesn’t disappoint it look great on the wrist and keeps good time. If your looking for a watch for people to admire then this is the watch for you.